Dan Austin has explored old paths and new throughout the world. 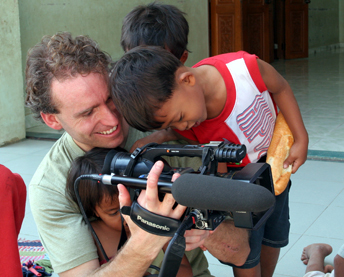 His documentary film "Petionville" explores the lives of Haitian street children, and his award winning film "True Fans" is a documentary about his 1999 mountain-bike pilgrimage across America. True Fans has screened worldwide, inspiring a musical and a book by the same title, written by Austin. Austin co-founded the 88bikes project, which endows an orphanage in a different country every year with bicycles, supplies and funds for upkeep. 88bikes has been featured on CNN and CNN international. A popular speaker on college campuses, Austin splits his time between New York City, the Wasatch Mountains of Utah, and the intimate and unique pockets of culture throughout the world.